KYIV, Ukraine—Europe’s two greatest security challenges, Islamist terrorism and Russian military aggression, have cast a shadow over the French presidential election. Authorities in Paris reported a possible terrorist attack on the Champs-Elysees on Thursday night, throwing the election a last-minute curveball—potentially to the benefit of the far-right National Front party’s candidate, Marine Le Pen. The two candidates who have arguably taken the hardest stand against terrorism and immigration, Le Pen and the conservative Republicans’ François Fillon, are also unabashed admirers of Russian President Vladimir Putin and apologists for the Kremlin’s military intervention in Ukraine. Fillon and Le Pen have both said the European Union should drop its sanctions on Russia, put in place for Moscow’s 2014 seizure of Crimea and ongoing proxy war in eastern Ukraine. “These sanctions are completely stupid, they have not solved any problems, they haven’t improved the situation at all, all they have done is created major economic problems for the EU,” Le Pen told CNN’s Christiane Amanpour in an interview, referring to the EU’s sanctions on Russia. “Both are trying to play with fears and they denounce [French President Francois] Hollande’s government for having failed in preventing the terror attacks in Paris and in Nice,” Nicolas Tenzer, founder and president of the Centre for Study and Research for Political Decision, a Paris-based think tank, told The Daily Signal, referring to Fillon and Le Pen. France is a nuclear power, the world’s sixth-largest economy, and a founding member of the European Union. Consequently, a lot is at stake in the upcoming French vote. The first round of voting is set for Sunday, with the two finalists squaring off in a second round on May 7. Fillon’s candidacy has been rocked by scandal, and widely discounted from reaching the May 7 runoff. Although, according to French news reports, he has made a late surge in the lead up to Sunday’s first round of voting. Le Pen has slipped in the polls, but she is still expected to reach the second round where she will likely face centrist Emmanuel Macron, the current frontrunner. France’s former minister of the economy, the 39-year-old Macron, is running his first political campaign—without the backing of an established party. Macron is expected to edge Le Pen in the final vote. France’s incumbent president, Hollande, a socialist, is not running for re-election. As of this article’s publication, French authorities were investigating whether Thursday’s attack in Paris was an act of terrorism. That attack, and a terrorist plot stymied by French authorities this week, might give Le Pen a late boost in the polls, some say. “It is … certain that the terrorist attack, which has been prevented this week, would have led to a surge in votes for the candidate of the National Front,” Marcel Van Herpen, director of the Cicero Foundation, a Dutch think tank that specializes in Russian and European affairs, told The Daily Signal. “Basically, the barriers between the far right and Les Républicains are falling, and we could also consider that if Fillon doesn’t run for the second round, some of his voters, maybe one-third, polls said, would turn to Le Pen,” Tenzer said. As part of a broader campaign to undermine Western democracies, Putin has exploited the threat of Islamist terrorism, as well as an anti-EU, anti-immigrant populism that has swept across Europe, to find an inroads to influence the French election. For Putin, positioning Russia as an ally to the West in combatting terrorism is a potential bargaining chip to exchange for securing sanctions relief. If Europe dropped sanctions without Moscow backing down on Crimea or eastern Ukraine, it would be a political windfall for the Russian leader as he looks to his own re-election campaign in 2018. For Le Pen, fears of terrorism and anxiety about Europe’s refugee crisis have proven to be political boons of her own. 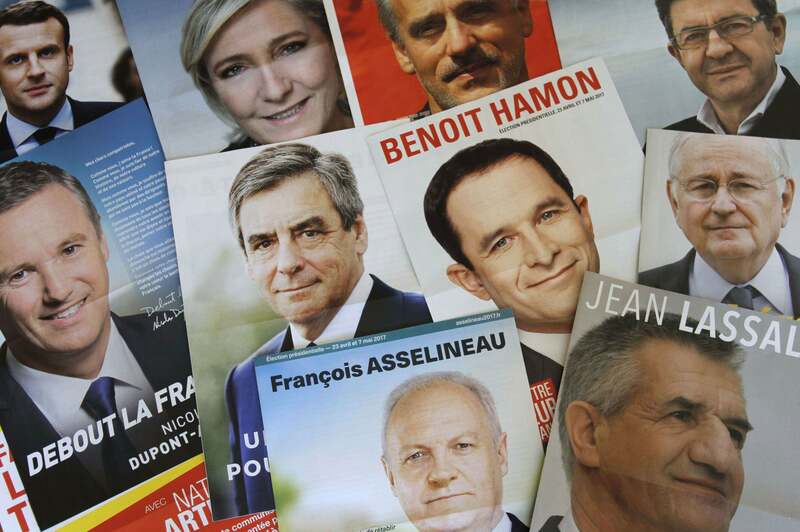 The National Front’s campaign platform taps into French Euroskepticism as well as voter anxieties about Europe’s refugee crisis and radical Islamic terrorism. 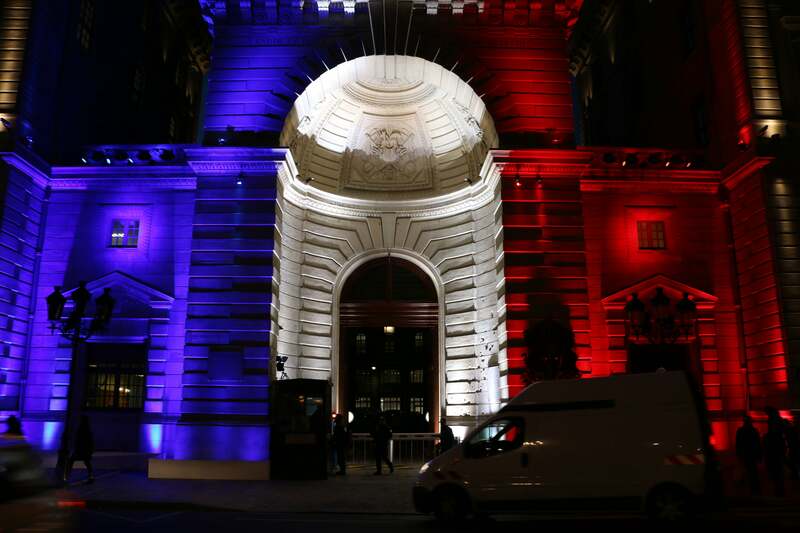 It’s a message that has struck a chord with the French people after a string of deadly terrorist attacks. “The aim of the Americans is to start a war in Europe to push NATO to the Russian border,” she said. In February 2014, pro-European street protests in Kyiv, Ukraine’s capital city, overthrew a kleptocratic pro-Russian regime that murdered more than 100 of its own citizens in its waning days. On Crimea, Le Pen said Russia’s hybrid warfare invasion of the Ukrainian peninsula never happened, and that the Crimean people willingly chose to rejoin the Russian Federation on their own accord. 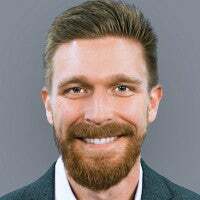 “I absolutely disagree that it was an illegal annexation. A referendum was held and residents of Crimea chose to rejoin Russia,” Le Pen told the French channel BFM TV. The EU and the United States have called the 2014 referendum illegitimate. 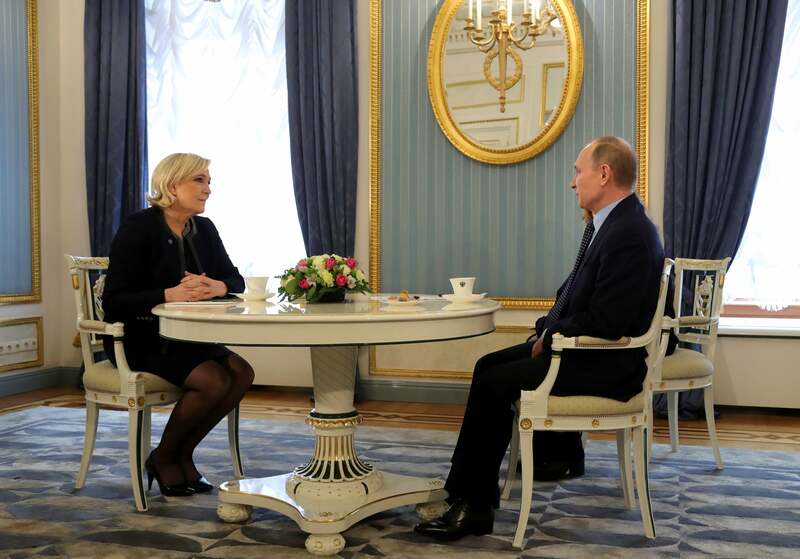 Le Pen has made several trips to Moscow to meet with government officials, including a meeting with Putin in February 2014 one month before Russia’s annexation of Crimea, according to the French investigative news site Mediapart. On a March 24 visit to Moscow, Le Pen told Putin that she wanted France and Russia to share intelligence related to fighting terrorism. “It is a public secret that the National Front serves the foreign policy of the Kremlin,” Van Herpen told The Daily Signal. Russian banks have financed Le Pen’s National Front party, providing tens of millions of euros in loans. In November 2014, according to French news reports, the National Front received a 9 million euro ($9.8 million) loan from the Russian-owned First Czech-Russian Bank, part of a 40 million euro request. Accusations that the loan was a reward for her position on Crimea were “ridiculous,” Le Pen said. As for Fillon, in March the French newspaper Le Canard reported that France’s 63-year-old former prime minister was paid 50,000 euros (about $54,000) by Dubai-based Future Pipe Industries Group Ltd. to set up a meeting between Putin, Lebanese billionaire Fouad Makhzoumi, and Total SA Chief Executive Officer Patrick Pouyanne at a conference in St. Petersburg, Russia, in June 2015. In November, Putin said he has a “very good” personal relationship with Fillon. Fillon and Le Pen’s stances on Russia diverge from that of Hollande, France’s current president—but it’s not a complete turnaround. Hollande has steadfastly supported the EU’s sanctions regime against Moscow. He has also been a party to the Ukraine conflict’s cease-fire negotiations. In 2014, the French president canceled a $1.6 billion deal, dating back to 2008, to sell two Mistral warships to Russia. At the time the deal was nixed, more than 400 Russian sailors were already in the French port city of Saint-Nazaire for training, and port facilities were under construction in Vladivostok. However, in the aftermath of the November 13, 2015, terrorist attacks in Paris, there was a warming of Franco-Russian relations. In the days that followed, Hollande reached out to Russia for intelligence on Islamic State targets in Syria for French retaliatory bombing runs. And on Nov. 26, Hollande flew to Moscow to ask for Putin’s help in fighting the Islamic State in Syria. Hollande’s outreach to Russia to combat terrorism underscored France’s tricky relationship with Moscow. 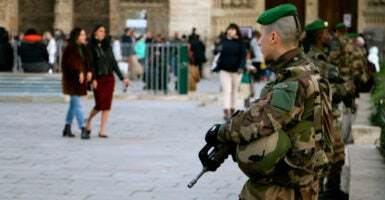 For the French people, terrorism is, without question, considered the top security concern. And polling has suggested that anxiety about terrorism has boosted support for the National Front. Less than a month after the November 2015 Paris attacks, the National Front won the first round of France’s regional parliamentary elections that December with 28 percent of the overall vote, effectively upheaving France’s political order overnight. This is an election as much about tectonic shifts to the defining traits of French civilization as it is about the fickle winds of the politics of the moment. Until the rise of the Islamic State, the Islamist terrorism threat in Europe had mostly been tied to causes anchored outside of Europe such as the Israeli-Palestinian conflict, the Algerian civil war, or al-Qaeda’s war on the West. However, the Islamic State’s terrorist attacks across Europe aren’t the consequences of far-off conflicts or distant grievances; they are, in fact, the symptoms of a conflict that has been brewing inside of Europe for decades. These attacks are an expression of rage by European-born Muslims against their homelands. Compounding the threat, some experts say that as the Islamic State loses ground in Syria and Iraq, the thousands of potential recruits the terrorist army was able to gin up every month to join its ranks in the Middle East are now being redirected to launch terrorist attacks in their home countries in Europe and the West. All of the known terrorists who carried out the Nov. 13, 2015, attacks in Paris, killing 130, were EU citizens. And at least one slipped back into Europe’s Schengen free travel zone pretending to be a Syrian refugee. In 2015 alone, more than 1 million refugees flooded into Europe—including about 660,000 from the war-torn countries of Afghanistan, Iraq, and Syria. Consequently, immigration and terrorism are hot-button issues as France chooses its next president. “I will be the president of those French who want to continue living in France as the French do,” Le Pen said. Fillon has pledged to punish anyone “who takes up arms against their country” by stripping them of their nationality. Moscow’s enthusiasm for a Le Pen presidency is not, however, shared by Ukrainian lawmakers. Signaling a potential diplomatic row should Le Pen be elected, Ukraine’s foreign ministry issued a pointed statement in January. “Making statements that repeat Kremlin propaganda, the French politician shows disrespect for the sovereignty and territorial integrity of Ukraine and completely ignores the fundamental principles of international law,” the statement said.